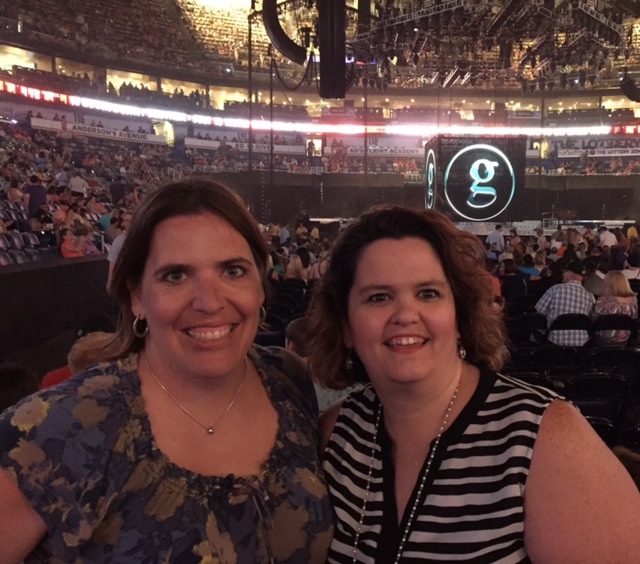 This past Saturday night (July 11) I had the opportunity to go to the Garth Brooks concert in New Orleans, LA. When I heard he was coming, I wanted to go and I asked a few friends. Only one had the time and wanted to go, so we decided to pursue some tickets. The day we bought the tickets, I reverted back to the 16 year old version of me with excitement! I was giddy! The week leading up to this week was so busy that I didn’t realize the weekend of the concert was upon us. Then I saw a friend on Facebook say something about going to the concert the following night. I thought, “hmm… she must be going somewhere else because that is not until next week.” Then it hit me… not that is THIS SATURDAY! I had made a plan for the event weeks in advance and it was all mapped out on my calendar, but I was living moment to moment in the busy week. Saturday came and I started my day. First on the agenda was the wedding shower in Hammond. I got up, dressed and headed down. I had a great time visiting with friends and meeting new people. It was a great celebration of the upcoming wedding of a very sweet couple (that had been to the house previous night for dinner and a visit). I rushed home to shower and change clothes to meet my friend, Lisa. We headed out and the excitement was building, but anyone that has travelled to New Orleans for any big event knows (and many times even without an event) traffic can quickly come to a crawl. Fortunately (and this doesn’t always happen this way), the traffic moving fairly quickly and thinned out some. We were in downtown at the superdome searching for a parking place. We found (a free one – YAY) quickly. Then we had hours…literally hours to wait for the concert to begin. We were even an hour and half before the event center even opened. First and foremost it was about parking. Second, when you travel to New Orleans… it’s all about the food (no matter the reason for the visit). We settled on Reginelli’s Pizza. Before you say, pizza… it’s local to New Orleans and it is not the standard pizza place and it was fabulous! On to the venue. We walked in and went toward the area that said floor seating. We had to get a wrist band before heading in. Oh, wow! I didn’t realize it was all of this to sit on the floor. We found our seat quickly and then it was more hurry up and wait. We sat, talked and watched people file in. I am a people watcher and New Orleans never disappoints with a variety of people to watch! The concert was set to start at 7 and as 7 approached people began to get to their seats and settle down. The announcer came on and everyone jumped to their feet thinking… here comes Garth. Nope! That was just a tease… it was to say he would be out in five minutes time. The collective moan rippled through and everyone sat back down. With one minute left the countdown began on the screen and you could cut the anticipation with a knife. People sprang to their feet and as the last ten seconds ticked the crowd counted down. The next thing I knew, Garth Brooks as on the stage singing!! How exciting! I could see him on the screen and if that giant would just step to the right or left I could see Garth himself (OK… he wasn’t a giant, but he was way taller than anyone around and in my line of sight). I’m maneuvering so that I can see better and I notice something…probably 2/3 of the people had their cell phones up filming and taking pictures. Here we are in a once in a lifetime event and they are worried about taking pictures or filming. OK, OK, I think, this is just the first song excitement. But it wasn’t just for the first song! It lasted THE ENTIRE CONCERT! This got me to thinking…when did we stop being in the moment? When did we stop experiencing what was happening now because we were worried about videoing or capturing it in a picture for later? Throughout the night, I watched just the people around us and many of them were videoing… the ENTIRE CONCERT! This was a truly amazing event. Garth Brooks put on an amazing show and much of it had to do with the energy of the crowd. A Louisiana crowd is always a welcoming one, but in New Orleans it is over the top! I didn’t want to miss one minute of it. I wanted to sing every word of every song (and I DID) and I wanted to dance and I wanted to enjoy every moment! I wanted to relive the songs of my teenage years and all the joy I had at dances and previous Garth Brooks concerts singing and dancing to them. I wanted to experience the concert…the live music and the fabulous musicians. But in some ways it was hard to do. As I looked up I had to look through the sea of cell phones to see the stage. I came to see Garth, not Garth on the small screen of other cell phones. At one point, I just wanted to yell, “put the phones down already!” Like anyone would hear me or it would do any good, but it would have made me feel much better! Lisa and I even remarked to each other about it. And again, I kept thinking…. When did we stop being in the moment as a society? Since I left the concert, this has been heavy on my mind. I began to think about other recent events I have been to and again…I recall seeing the sea of cell phones up to “capture” the moment. And then Kevin gave an illustration in his sermon on Sunday of a person visiting Switzerland and wanting to meet the great theologian, Karl Barth. This gentleman unknowingly sat down next to Karl Barth and began to talk with him. They were visiting on the bus when Barth asked him, “What do you hope to see in our fine city?” “Oh, I really want to meet the theologian Karl Barth” replied the visitor. Karl Barth replied, “I know him well, I shave him every day.” This gentleman left saying, “Wow, I met Karl Barth’s barber today!” This gentleman totally and completely missed experiencing Karl Barth, the very man he hoped to meet! I think this is exactly how we are in our culture today. We are more interested in the photo op than the moment. Our need for instant gratification is so great that we cannot live in the moment, we have to be sure that we get that video or picture so that we can save it for later to see and relive it again and again! Remember I told you that I did take a few pictures and a couple videos. Since the concert, I’ve looked at both. I just knew it would be great to revisit what I had experienced. I especially wanted to show Kevin the reaction to “Callin’ Baton Rouge”. I can tell you, it wasn’t that great. It just wasn’t the same! You just cannot compare a video to the “moment”! Even today, Lisa and I had lunch with another friend and we recalled the concert. We recalled our experience, but it was a “you just had to be there!” kind of thing. And that is ok! We need to savor those moments and enjoy! I challenge us all that when we have the opportunity to experience an event, we do just that… experience the moment! Please, do not think I am saying do not snap a picture for posterity. But snap a pic and savor the event. Don’t stress about getting that video or picture…be in the moment! Experience all the things that are happening in that moment. Take the picture in your mind… that picture never fades or goes away!